The Writer’s Market series is something that should be a building block in any aspiring writer’s library. 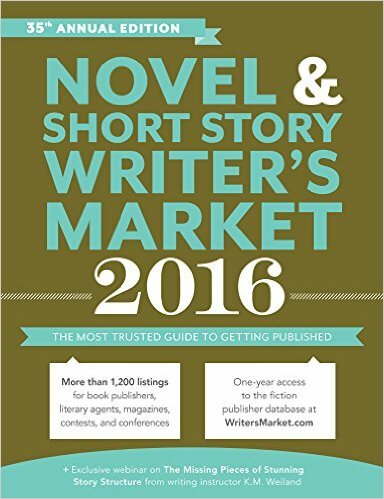 I own the 2016 Novel and Short Story Writer’s Market and I have found it amazingly helpful. It has a nice selection of articles on the craft and business of writing, and interviews with established writers. The most useful resource, however, are the extensive listings of agents, magazines, book publishers, as well as contests and awards. These listings make up the majority of the book. Though somewhat daunting, they are fairly easy to wade through due to the helpful symbol index indicating things like whether the market accepts unsolicited submissions or if has a specialized focus. This book is a great resource, especially if you have just written a novel or short story and want to publish it. In fact, it is perfect for Wrimos who kindled their love of writing this past National Novel Writing Month. There is even a testimonial from Grant Faulkner, the executive director of NaNoWriMo, saying how useful this book is for those who have just hit the 50,000 mark on their word count. If you don’t want to spring for the $25 but are looking for more advice and writing articles, check out Writer’s Digest online. Writer’s Digest publishes the Writer’s Market series and their site is full of great free resources. I recommend signing up for their newsletter as it is really motivating to have writing articles come directly to your inbox. Check It Out: Bowl Like A Punk.